When Harry Blackmun first joined the court, his constructionist philosophy of restraint ruled in his opinions. Later, however, he would give more priority to his more basic instincts of justice. 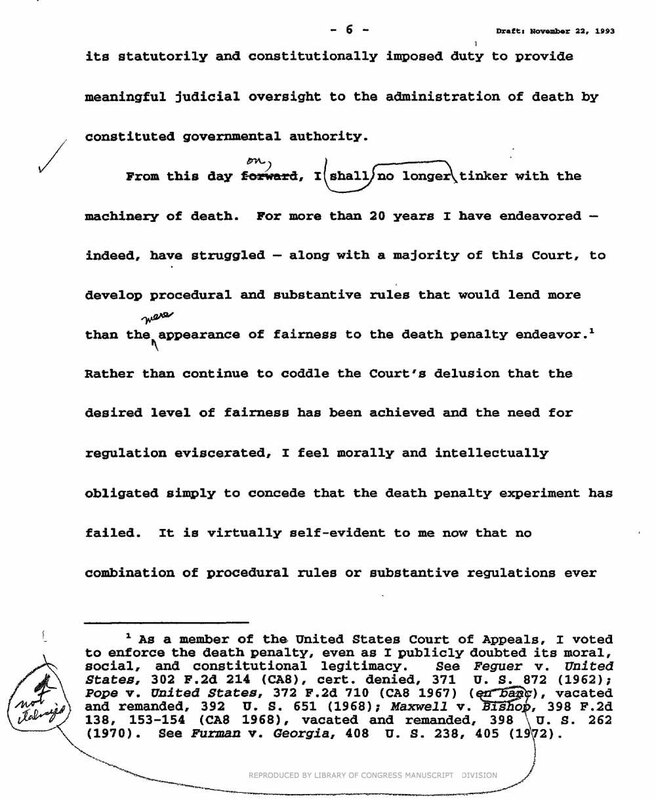 Blackmun wrote in 1972’s Furman v. Georgia of his “distaste, antipathy, and, indeed, abhorrence for the death penalty.” However, he dissented with the minority, the Court’s conservative bloc, to uphold the constitutionality of capital punishment, believing that determining what constitutes “cruel and unusual punishment” by the Eighth Amendment was a legislative matter, not a judicial one (114). Blackmun might have argued that it was not the death penalty itself, but rather its application, that made it unconstitutional in particular cases. Indeed, by 1983 his patience—and conscience—were tried so much that he received 86 requests that year for emergency stays of execution. Certain states, such as Missouri (162) and Florida (164), were setting execution dates immediately after convictions were upheld, ignoring Supreme Court rules that allowed petitioners 90 days to file cert petitions. Blackmun was aggressive with granting stays with strong wording, but the situation improved little. An excerpt from Blackmun's 'death penalty dissent' in Callins. "I feel morally and intellectually obligated simply to concede that the death penalty experiment has failed." The beginning of Blackmun’s transformation regarding the death penalty came in the capital case Darden v. Wainwright, a case in which, many suspected, a black man’s due process was infringed by overt and covert racism. The Court had four votes to grant certiorari, but lacked the one more necessary to stay an execution. This would have resulted in ultimately hearing the appeal of a dead man, something that troubled the justices so much that Lewis Powell caved and provided the fifth vote to stay the execution at 11:59 PM the day before it was scheduled. An explosive internal discussion erupted among the justices regarding ways the Court could change its procedures for the appeals of capital cases. The Court affirmed the conviction, Blackmun believed, due to some of the justices judging the merits of the case before it was even argued. For Blackmun, this “unfair trial” combined with the animosity between him and Burger (which likely caused Burger’s almost immediate resignation) made this “the most difficult” of the terms in which he had served (172-3). Indeed, it affected him so much that he wrote against a majority opinion written by his earlier self. In McCleskey v. Kemp (1986), Blackmun supported a defense using statistical disparities to demonstrate racial bias in the application of the death penalty, which he had rejected 18 years earlier in Maxwell v. Bishop. Herrera v. Collins in 1993 truly broke Blackmun. Callins petitioned for a writ of habeas corpus based on new evidence that his recently deceased brother had committed the murder. Rehnquist wrote that his evidence did not meet the “extraordinarily high” burden required to reopen a case so long after the conviction. Blackmun read his dissent aloud from the bench, infuriated by states’ executing “whomever and however they please”, unchecked by the Court, and that this action that neared “simple murder” of a man with proof of his innocence sharpened his “doubts about whether...capital punishment remains constitutional at all" (175). 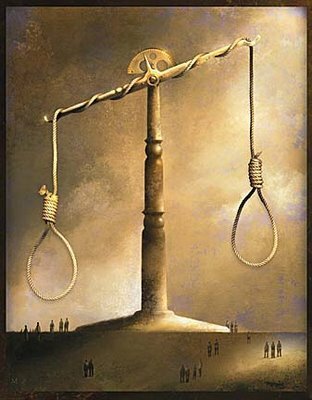 Every death penalty decision to follow during Blackmun’s term would include his dissent, “adhering to my view that the death penalty cannot be imposed fairly within the constraints of the Constitution” (179).